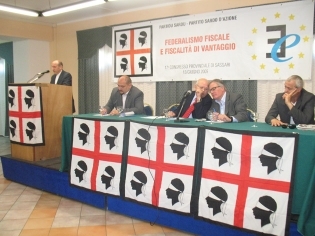 The PSd'Az is a social-liberal regionalist party in Sardegna, originally founded in 1921. It started strong after WW2, but declined in the 1970s; the 1980s brought some gains, though. Currently the PSd'Az holds 5 seats in the regional parliament. The party was usually allied with left parties, but recently it allied itself with the center-right. The flag of the PSd'Az is one of the oldest political flags in Italy continuously in use. Early photographs already show the general design of the flag [1,2]. 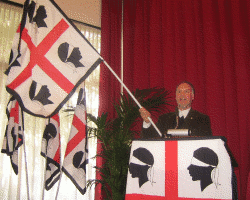 The flag is a version of the Sardinian flag with the four Moors. It is usually square, white with a red cross and a black border, and the Moor's heads in the corners [3,4,5]. The party symbol shows the party flag surrounded by party name and abbreviation. Cubeddu, S (1993/1995) Sardisti - viaggio nel Partito Sardo d'Azione tra cronaca e storia. Volume I: pp. 355, 356, 366; Volume II: pp. 205, 206, 212, 214, 399.